This week’s question comes from a US citizen living overseas. He hasn’t filed a tax return in years! He wants to know what the maximum penalty applicable to the late filing of his tax returns would be. I will try to bring a little rainbow in the world of taxation today. One word of warning though is that you need to meet all of these conditions to fall into the “no penalty” zone. Many Americans working and living abroad have been non-compliant with their taxes for one or more tax years. The consequences of this can be very large. The IRS has a program “Streamlined Foreign Offshore Procedures”. It can remove any penalty! However, this post is about cases when you don’t need it. There are specific circumstances a non-compliant person may meet which would not require them to file. First, the income was less than $10,350 (that is the 2018 amount – it is indexed for inflation). U.S. citizen abroad did not own a foreign corporation or trust. In this case, American living abroad don’t have to file a tax return. The fact that they are non-compliant probably won’t incur any penalties. In regards to Foreign Bank and Financial Accounts (FBAR), the aggregate balance of all non-US bank accounts must be more than $10,000 to require filing. If you own a foreign corporation, foreign trust, or hold more than $200,000 in foreign bank accounts, you need to file several forms. Each of these forms come with a potential penalty. If there is no tax owing, they might still have this $10,000 penalty (although unlikely). 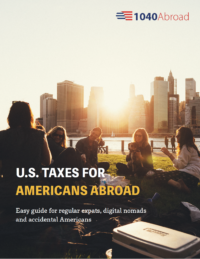 If your friend pays more tax to a foreign country than would be owing in the US, he/she would generally get a credit to offset their US tax owing. This is a favorite among digital nomads. There are two ways to qualify for the FEIE: either the physical presence test (spending at least 330 days abroad in any 12-month period) or the bona fide resident test (typically a permanent resident card and are treated as a resident there for tax purposes). The late filing penalty and interest are based on the amount of tax owed. You would still need to file but could use the regular procedure since no penalty would be assessed anyway. If you have past due FBAR reports, your smartest course of action would be to file right away. The IRS/FinCEN won’t request penalties, so long as you have not previously been contacted by the IRS regarding your failure to file (or are under a civil audit or criminal investigation by the IRS). In any other situation though, it is highly likely you will be assessed a fine of $10,000 or more for failing to file. We will give you an honest assessment of your situation. Being tax compliant can bring peace of mind, knowing the potential penalty and ways to get straightened out can also bring peace of mind. There are ways to minimize any money owed, and you might find the process is much simpler and cheaper than you imagine. Moving forward, you will feel safer knowing that your life and business are completely above the board in regard to taxes. If you or someone you know are non-compliant, we’d love to talk to them about their options for changing that.